I just got back from the dentist's office and frankly, I think I got gypped. Big time. I'm not saying they did a crummy job of cleaning my teeth – quite the contrary. The hygienist was so thorough she was literally chipping pebbles out of my gums before it was all over (did I mention I'm not very good about flossing?) And I certainly don't mean to imply there was anything slipshod in my actual exam. In fact the dentist spent a surprising amount of time poking and prodding around in my mouth, and even offered an unusually candid opinion about professional bleaching treatments, and how the only difference between them and the kind you buy off the shelf at Walgreen's is the price! And speaking of my oral history, believe it or not I have almost total recall of my very first trips to the dentist, way back when I was just a little girl. This was around 1960 and my dentist, Dr. Young, actually wore a crew cut. Even now I have this visual image of him bending down peering into my mouth, and me starting up at the light bar behind him through the short stiff hairs standing straight up on the top of his head. 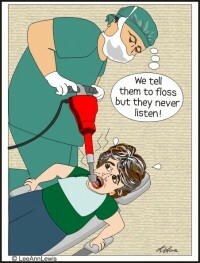 But not all my childhood dentist recollections are quite so amusing. Some are downright chilling. I mean, there I'd be, sitting quietly in the waiting room reading the latest issue of "Highlights Magazine” (Goofus might have been a jerk, but to me Gallant was every bit as creepy) when all of a sudden I would hear this gosh-awful noise coming from the other side of the door. If I live to be 102 I'll never forget that sound. Some kid was being tortured back there, and I knew it was only a matter of time before I faced the same fate. After all, by this point I'd had my share of cavities, and believe me I knew the drill…literally! Oddly enough it's the memory of those early trips to the dentist (both pleasant and unpleasant) that caused me to leave my appointment today feeling like I had been gypped. You see in Dr. Young's office there was this drawer, and after every visit his patients were allowed to open that drawer and choose a toy as a reward for being such a good patient (even if we'd screamed our heads off and bitten his fingers in half!) Somehow that small prize, whether it was a fake ruby ring or a rubber turtle or a magnet or a 2” pencil, made the whole disturbing ordeal worthwhile. Nobody makes me go to the dentist these days. I go because I'm a grownup and that's what grownups do. Even knowing that I'll probably have to pay hundreds of dollars to get a crown replaced (there's that hymn in my head again), and that it's going to hurt when the initial deadening shot touches my gums, and afterward my lip will be numb for hours, causing me to talk funny and drool down my neck – even knowing all this, I still show up for the appointment. Instead the only "reward” I got for today's visit was a hefty co-pay, an appointment card with a date six months out circled in red, a new toothbrush and some dental floss (as if). I know I sound like a whiny little kid here but I don't care. I said it before and I'll say it again. I think I got gypped. Big time. Search for As I See It articles similar to "Inci”dental” Reflections. Search all articles similar to "Inci”dental” Reflections".